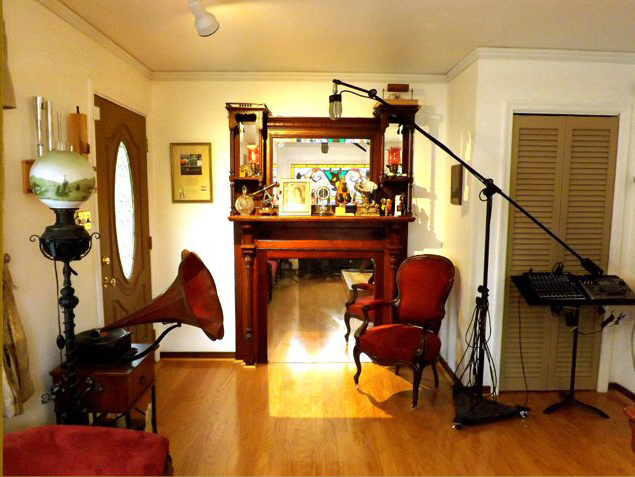 This is a view of the music studio located on the main floor of the DeMajo residence in Richmond. The stained glass window on the studio exterior wall, is an exact replica of a Tiffany Studios of New York window that illuminated the dining room of the Bogan Mansion located on historic Esplanade Avenue in New Orleans. The replica was commissioned by John DeMajo for his new home in Richmond, and it was created by Carolyn Insler of Visions Stained Glass Studios located in Chattanooga, Tennessee. 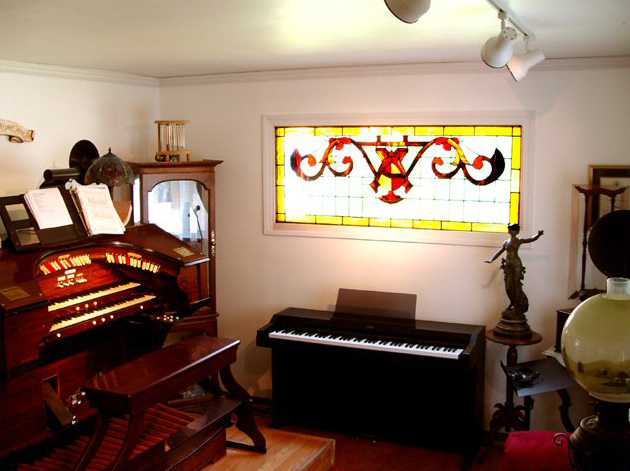 The music studio is furnished in the style of an early 1900's "Industrialist's" parlor. 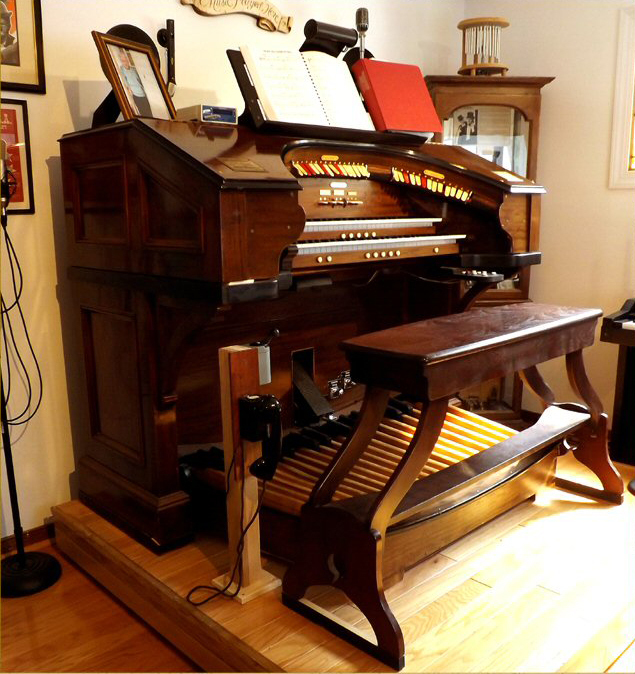 Visible, along with the 1926 Wurlitzer organ and accompanying piano, are an authentic 1860's Victorian couch and parlor lamp, various artifacts which came from the historic Richard and Bogan homes in New Orleans, and a 1920's Radiola and horn speaker at right that are part of the DeMajo Wireless Equipment Collection. Relay: Artisan Umidi system. Presets: 10 general, 1 General Cancel, Set and memory levels ( 99 memory levels are available). 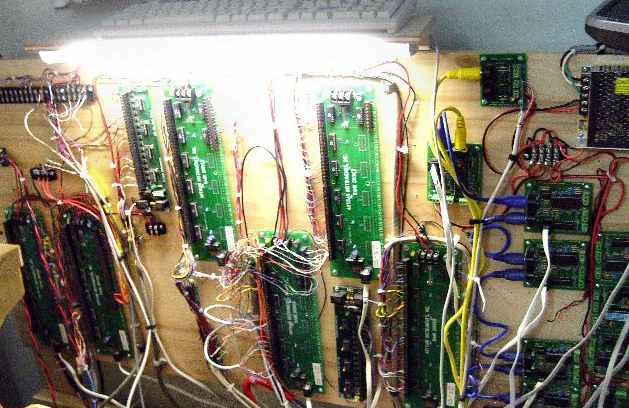 Player mechanism: Artisan Midi Sequencer at console. 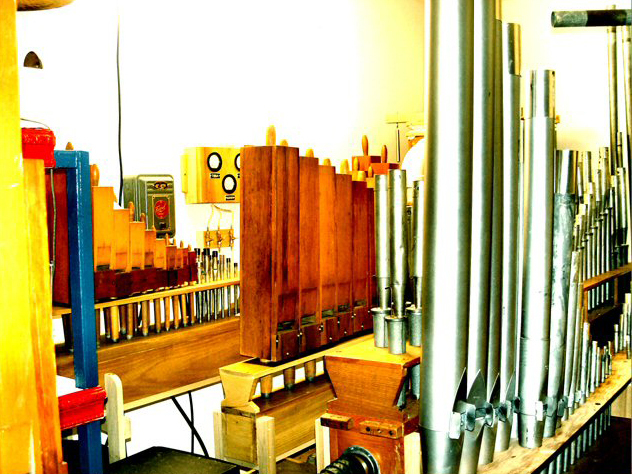 ORIGIN OF RANKS: Tibia, Vox, Salicional and Diapason: The Princess Theatre in New Haven, CT.
CHESTS: Replica Wurlitzer Diatonic chests constructed in the DeMajo Organ Works Shops in Hammond, LA and Richmond, VA..
Because of the distinct possibility that the government will soon be regulating the use of individual appliances in our homes, through the use of "smart" electric meters, I have added the following equipment to my home organ project in anticipation of the coming day when our ever encroaching government decides that we no longer have the Constitutional right to operate unnecessary electrical equipment such as organ blowers. 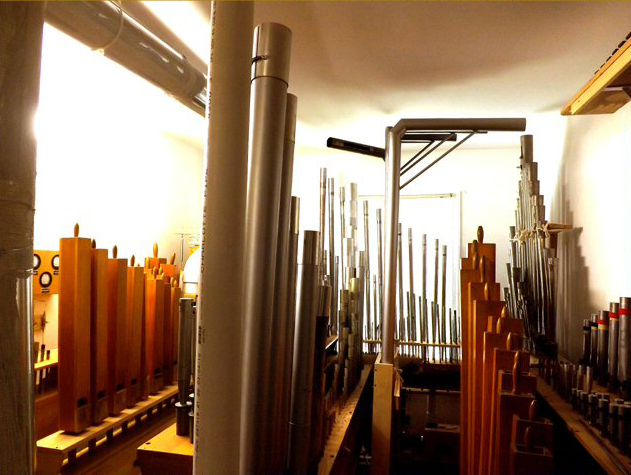 The following is a complete "virtual" organ that can, with the touch of a button, be played from my existing pipe organ console. 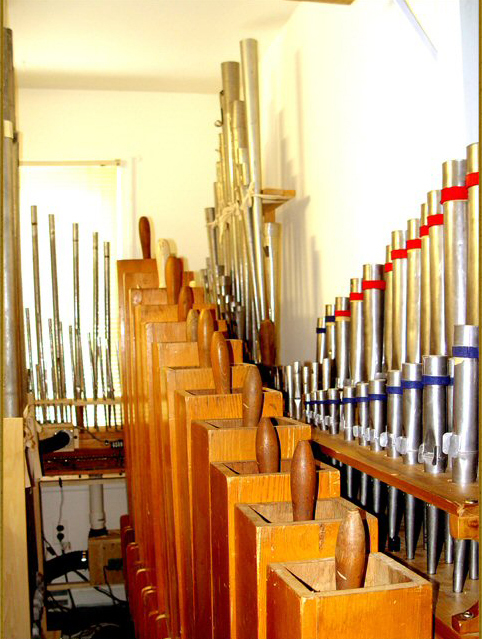 This allows the blowers to be turned off and the console to be used as a "state-of-the-art digital electronic organ. Sound generation source: Artisan sound engine utilizing solid-state drive technology computer running Linux OS. 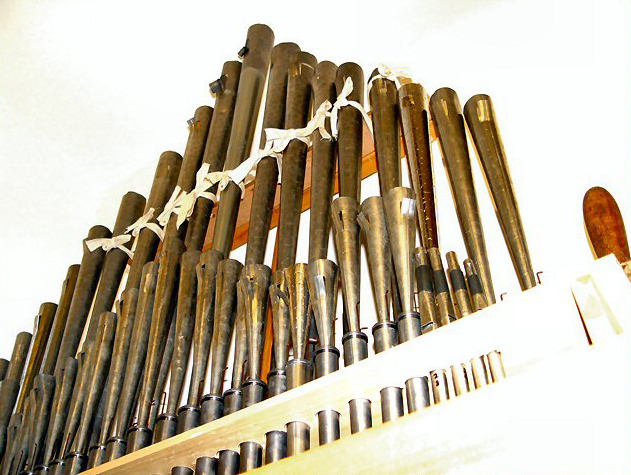 Virtual Ranks: Identical to pipe organ ranks above. (All ranks are duplicated with equivalent virtual ranks. There is no supplementing of original ranks performed with this system. Speakers: Two custom built enclosures containing high-compliance 15" SAMPSON woofers, 8" mid-range speakers by Electro-Voice and and quartz tweeter. 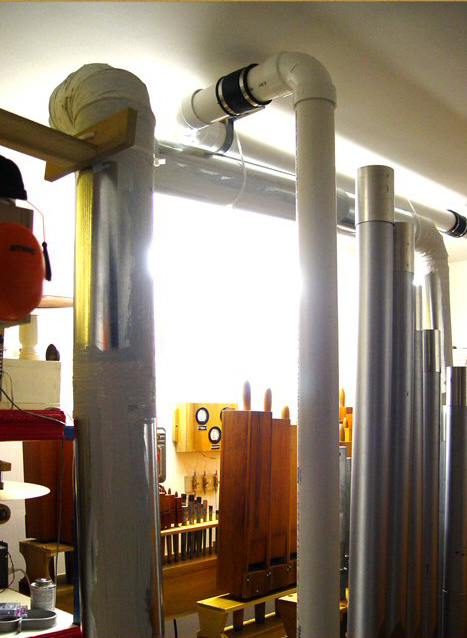 Speakers are located in pipe chamber, and volume is controlled acoustically by existing swell shades and Peterson computerized swell shade operator. 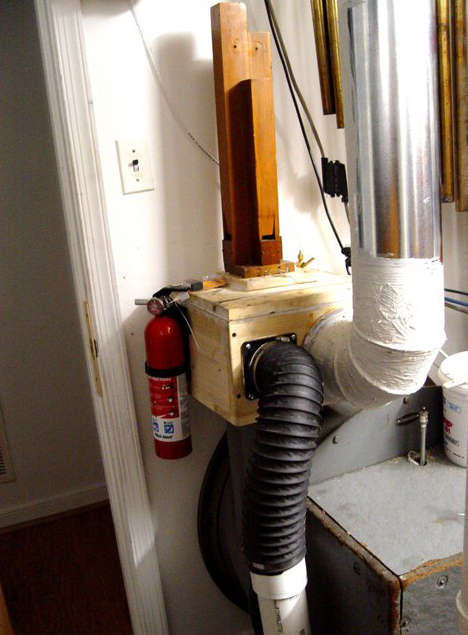 THE PIPE WORK IS INSTALLED IN A 14 X 12 FOOT CHAMBER FORMED IN A CONVERTED EXTRA BEDROOM ON THE THIRD FLOOR OF THE HOUSE. SOUND SPEAKS OUT OF A SPECIALLY DESIGNED SWELL SHADE FITTED DOOR, INTO THE UPSTAIRS HALLWAY AND DOWN A GLASS ENCASED STAIRWAY WHERE IT EXITS INTO THE MUSIC ROOM LOCATED ON THE MAIN FLOOR. GLASS BLOCKS, WHICH FORM THE STAIRWAY WALL. 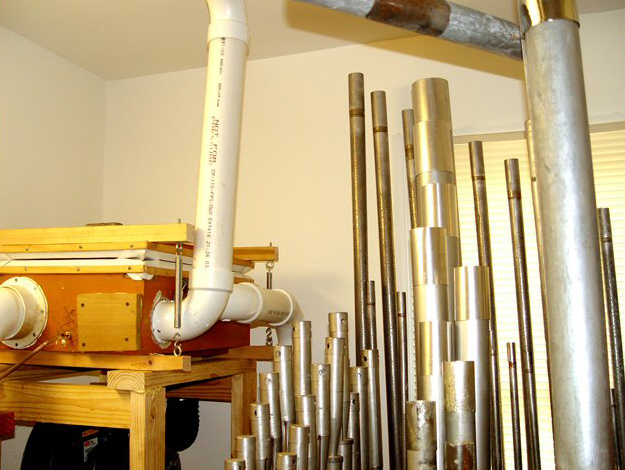 ACT AS A SOUND CHUTE TO DIRECT THE SOUND OF THE ORGAN DOWN TO THE MAIN FLOOR OF THE HOUSE. 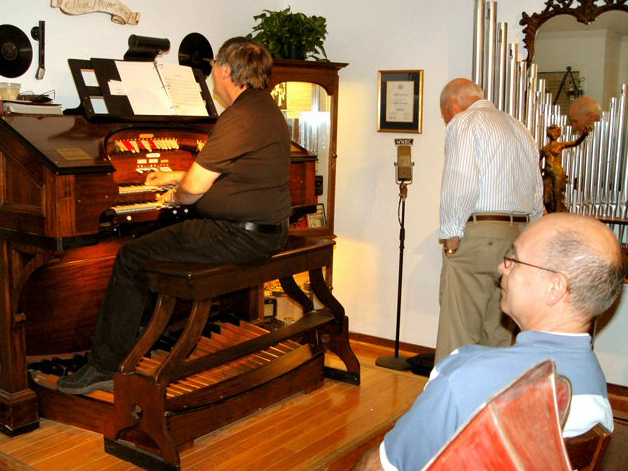 Above: Members of the OLD DOMINION THEATRE ORGAN SOCIETY attending a May, 2015 recital in the museum's organ studio. 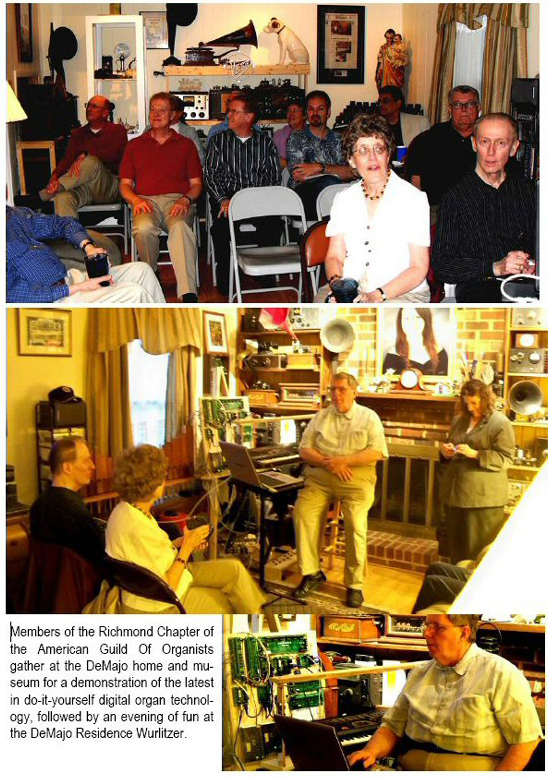 Below: Members of the RICHMOND CHAPTER of the AMERICAN GUILD OF ORGANISTS enjoy a "Theatre Organ Night Out" at the museum. On a trip through Richmond, nationally acclaimed recording artist and A.T.O.S. 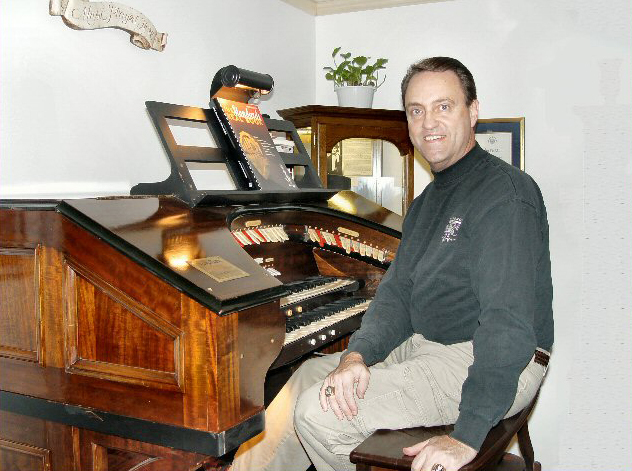 president/CEO Ken Double, pays a visit to the Museum Of Yesterday's organ gallery. And also while visiting Richmond, Theatre Organ Society International secretary Col. Jack Moelmann and Father Gus Franklin, T.O.S.I. 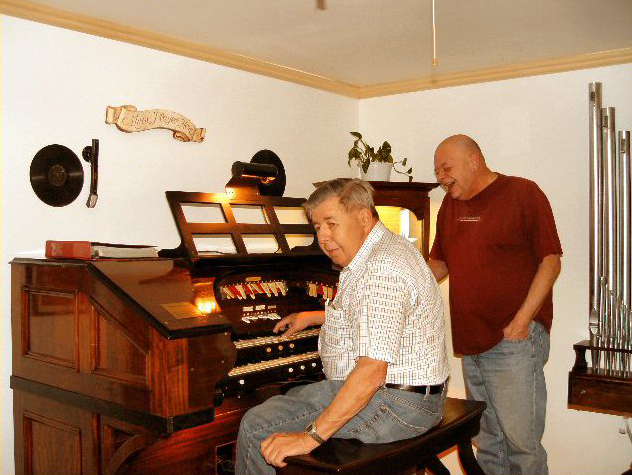 president, are seen putting the museum's Wurlitzer through its paces. 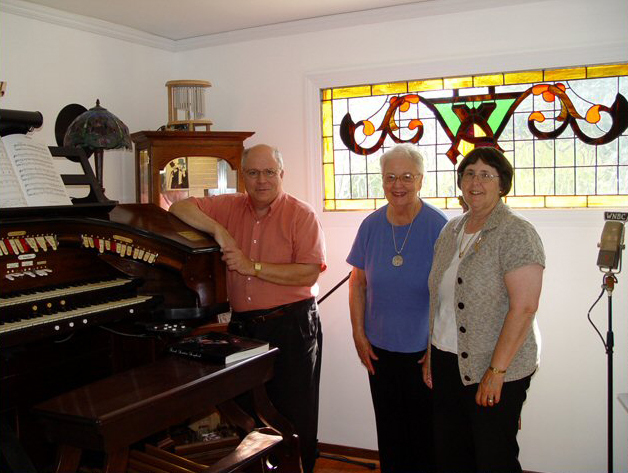 Organ historians Rachelen Lien, Dr. Linda Fulton and William VanPelt pay a visit during the summer of 2010. In this photo, the new stained glass window had been installed in place of the facade rank. 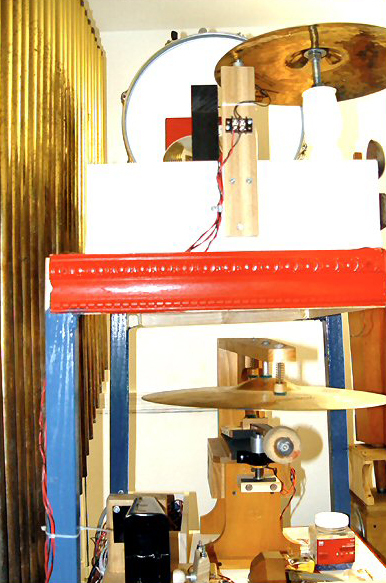 WURLITZER TIBIA RANK AND BLOWER CONTROLS AT LEFT CHAMBER WALL. 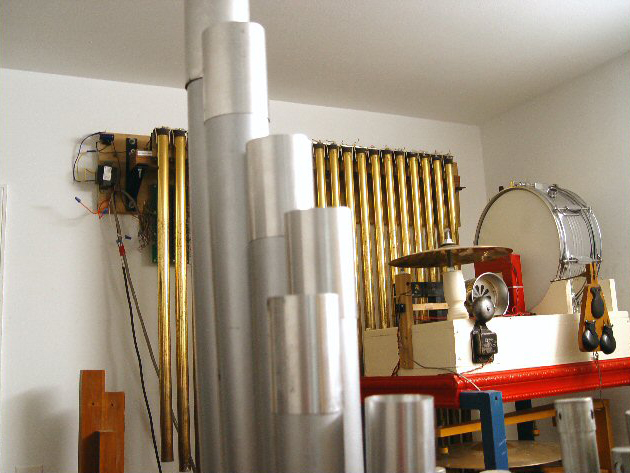 THIS VIEW WAS TAKEN DURING INITIAL CONSTRUCTION AND SETUP OF THE INSTRUMENT, THUS THE TEMPORARY ORGAFLEX DUCT WINDING SYSTEM IS STILL VISIBLE. SINCE THE PHOTO ABOVE WAS TAKEN, ALL WIND LINES HAVE NOW BEEN REPLACED WITH PERMANENT PVC AND JOVAL METAL PIPING. 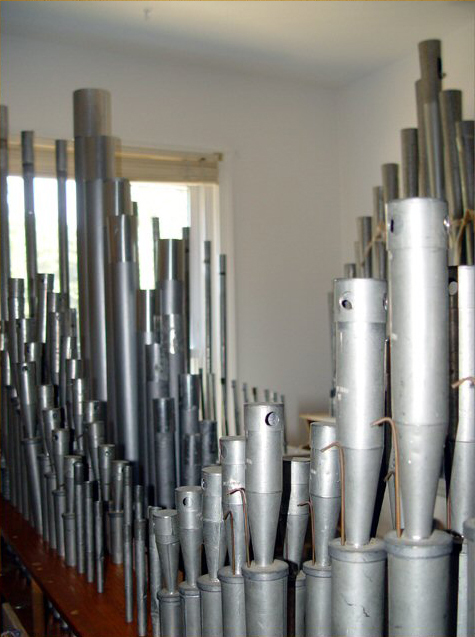 BELOW IS A PICTURE OF THE SAME SECTION OF THE CHAMBER AFTER INSTALLATION OF THE NEW METAL AND PVC WIND LINES. Another view showing placement of the chamber and the main wind trunk. 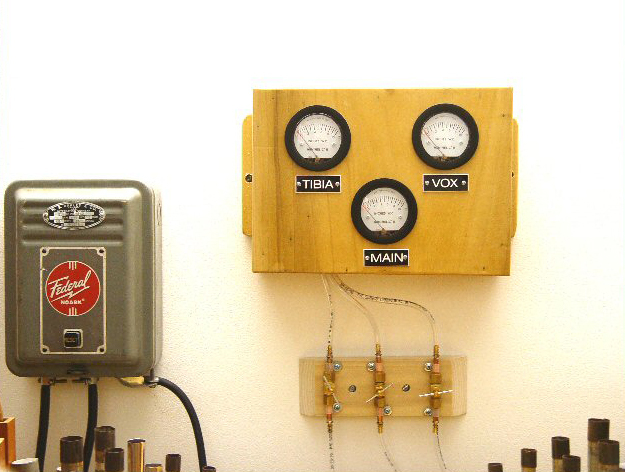 The panel above is a custom-built wind pressure monitoring panel that we offer for sale as a custom order item. It allows check and monitoring of pressures on each division of the organ, at a glance, from anywhere in the chamber. This simplifies winding adjustments when tuning or voicing, and it allows periodic monitoring of blower performance and development of any leaks in the system. Toy Counter, Traps and Chimes shown on the specially constructed Toy Counter rack at the left side, rear corner of the pipe chamber Additional traps and effects are installed, where they are visible when operating, on the antique cherry wood mantel of the music room fireplace. 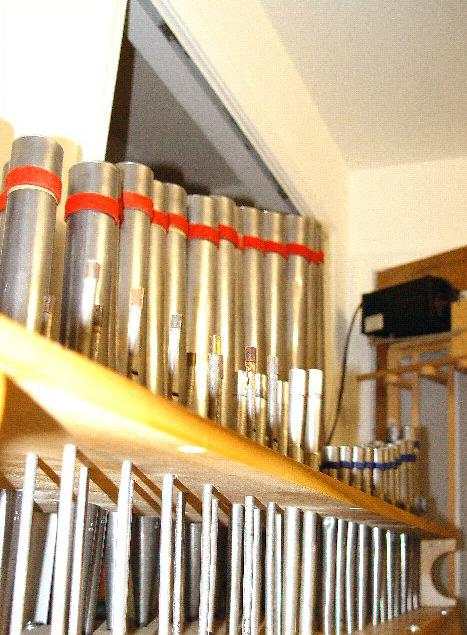 Deagan 21 note tubular chimes at front chamber wall. 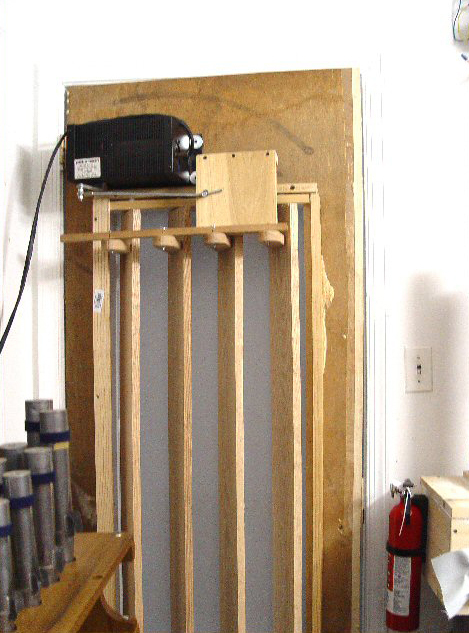 View of swell shade assembly and swell shade operator. Swell shade assembly was fabricated in our shop, and designed to replace an existing 36" door. This system makes it unnecessary to deface the walls of a home or other location in order to install swell shades. The home or building can be returned to its original configuration at any time by removal of the shades and reinstallation of a standard door..
Below: Another view showing the far end of the "WOLD" Radio broadcasting studio at the Museum of Yesterday. 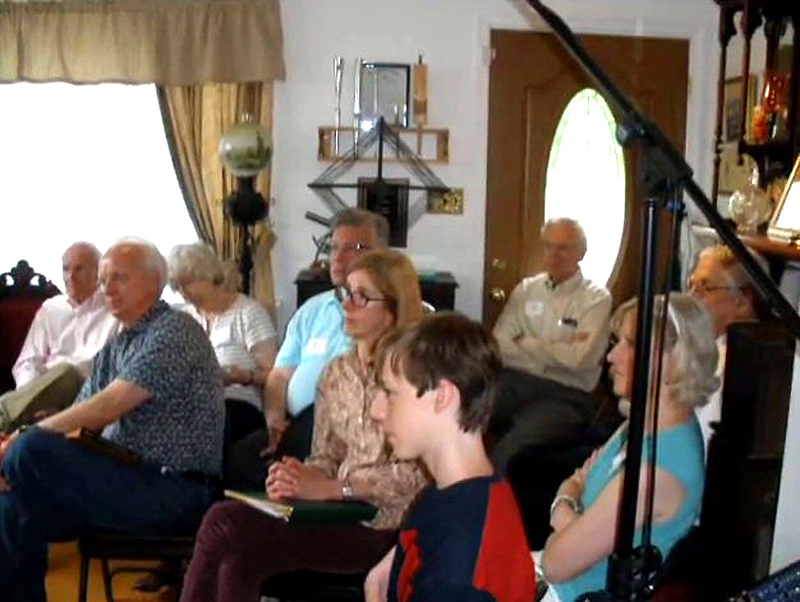 The studio is used for productions including organ concerts and old-time radio broadcast recreations by theatre groups who perform authentic radio plays.